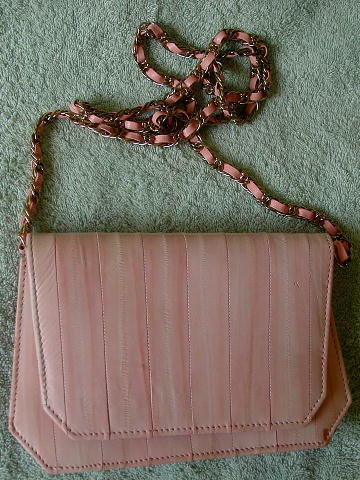 This genuine eelskin purse is in multiple tones of baby pink. 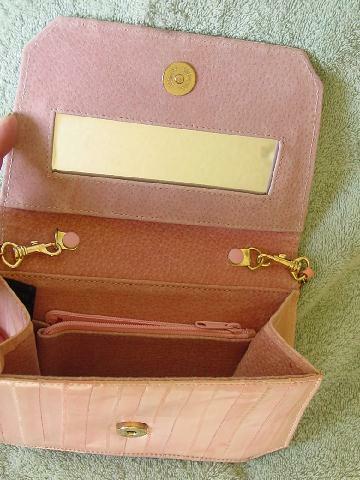 The interior has a pink suede lining with a rectangular shaped mirror on the interior flap and there is an interior zippered compartment. It has a 48" long detachable gold-tone multi-link chain with bright pink leather woven throughout. Unhook the chain and carry it as a clutch. It's a very pretty color and nice soft eelskin.